Beans are an easily grown garden vegetable. With all the varieties, it can be difficult to choose the best bean varieties for you. Some are available only as bush beans, such as wax beans or lima beans, while others can be either bush beans or pole beans. The way the plant flowers directs whether it will be a bush or pole bean, and that has direct bearing on how tall the plants will grow. Bush beans are determinate plants. Determinate plants form their flowers at the tip of the growing end, called the terminal point. This prevents them from elongating further. Flowers form in clusters and, after pollination, give way to fruit. Once all the terminal points have produced their flowers and fruit, the plant ceases to produce more and begins to die back, having completed its function. Bush beans are short, compact plants reaching an average height of 18 to 24 inches depending on the variety. Beans of many varieties can be grown as bush beans, like snap beans, lima beans and wax beans. Green snap beans such as bush blue lake, tendergreen and tendercrop are common garden varieties. Yellow or wax beans such as goldcrop or sungold and purple specimens such as royal burgundy are also favorite bush bean selections. Pole beans are indeterminate plants. Indeterminate plants form flowers in the axle of the leaves and stems. This leaves the stem free to grow indefinitely. As it continues to grow, it is capable of producing more flowers and fruits. 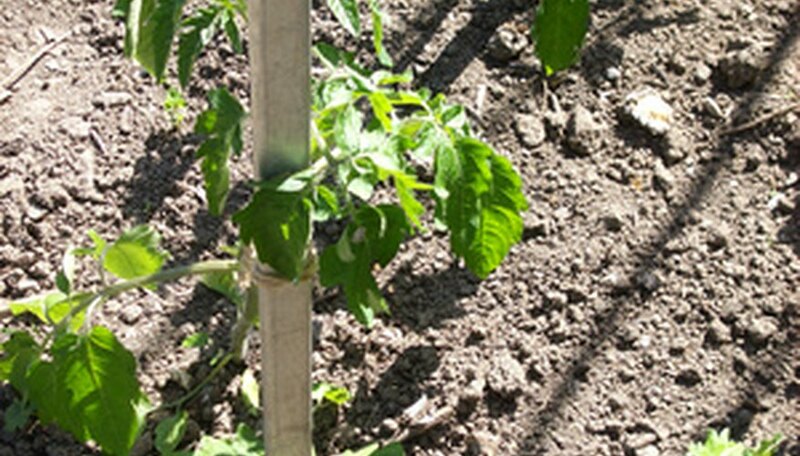 Because it can continue to grow in this manner, pole beans take on a vining quality and use that to climb any support, whether it is a trellis or nearby plants such as corn stalks. Pole beans are climbers that save space in the garden but require support in the form of a trellis or fence. Many varieties reach heights of six feet or more, depending on variety and soil ecological conditions. Commons selections for the garden include Kentucky wonder, Kentucky blue lake and purple pod bole beans. Bush beans are more suited to gardens with plenty of room for plenty of plants. The shorter bush-type plants make harvesting easier. Since most of the beans are produced at one time, harvest and subsequent storage can be done at the same time. Pole beans, on the other hand, are better suited to smaller gardens where space is a concern. Their upright growth conserves space. If preserving the beans is not a major focus, the ongoing production may be a benefit. The more beans that are harvested, the more stimulated the plants are to produce more. In this way a smaller but steady supply of beans is available.